Life for a mid-market caravan can’t be easy. The entry-level range is always popular because it’s cheap, while the flagship line is desirable for its luxury features, and the middle models can be a bit forgotten. Bailey is attempting to tackle that mid-market malaise head-on with its all-new Pegasus. The seven-model range boasts three new layouts, headed by the twin-axle Palermo. The most obvious change is that, like the Unicorn, the Pegasus now has bright Polar White sidewalls in place of the GT65’s drab Magnolia, set off by fresh new graphics featuring Bailey’s ‘flying B’ and smoother, simpler front and rear bumpers in ABS plastic. It’s a big improvement. This looks like a big caravan and that’s just what it is, measuring just shy of 8m from hitch to rear bumper, and weighing in at a pretty hefty 1760kg if you take up its full 187kg payload. That means you’re going to need a large tow car, but we found that it felt extremely stable on tow, the twin axles helping stability such that you don’t notice the fact that ATC is no longer standard equipment (though it is on the options list). Not that this isn’t a well-equipped van: it’s pre-wired for a mover and Secure wheel lock ready, plus there’s an AKS hitch stabiliser, an external 230V socket, alloy wheels and two hatches to access the under-bunk storage. The heating has been uprated, too, from the 4kW system of the old Pegasus to a Truma Combi 6E. Once on site, cut-outs in the side skirts and guides beneath the rear panel make it easy to access the steady winders. If you step straight from a Unicorn you’ll notice that the Pegasus is some 2in narrower, but otherwise this feels like a gigantic space inside, with 6ft 5in headroom throughout thanks to the new LED perimeter spotlights negating the need for central light fittings. And the lounge is as comfortable as it is spacious. One of the key developments for 2016 is the new front bed system (about which more later), which allows the use of high-backed, curved and notably domestic-style sofas. Together with the angled backrests, it makes for a very tempting place to sit, even though the new ‘Dream Sleep’ system prevents traditional knee-rolls. Our test van was fitted with the £199 optional ‘Belvoir’ trim, in practical dark grey, which comes with a neat ‘shark’s fin’ corner bolster for the open-ended nearside sofa. Whether you go for that or the paler (and to our eyes more attractive) ‘Richmond’ scheme, the whole interior ambience is far more modern than the GT65 and the sofas are huge, with room for eight to sit for dinner. Neat detailing abounds, such as the new built-in curtain pelmet, and should you have additional guests there’s a two-seater dinette to the rear of the van, which makes an ideal play space for children during the day. 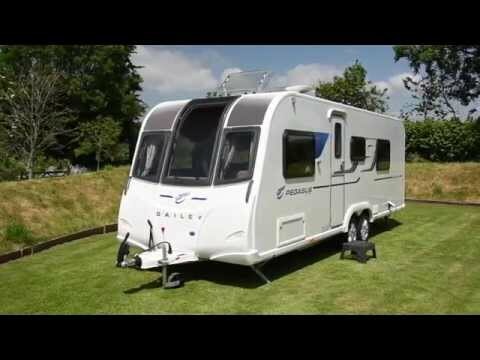 Bailey Caravans has been surveying customers to find out what they like and don’t like about their vans, and the results show in the new Pegasus. Take the oven: it has been moved around 10cm away from the bulkhead, because owners complained that there was nowhere for the pan handles to go. The space created beneath is occupied by a wine cupboard, which means the one on the worktop can be deleted and there is no reduction in food preparation space. If you do need more, all 2016 Pegasus models get a fold-up worktop flap, and there’s a simply vast sideboard on the nearside. Like the Unicorn, the Pegasus now has an island-style curved kitchen unit, this time with a built-in cutlery drawer, while the large fridge/freezer has been sited lower to make the microwave above it easier to access. Another change as a result of customer feedback is to the lighting: there’s a much bigger kitchen window, and improved task lighting under the cupboards should make life easier for evening cooks. Like every model in the new Pegasus range, the Palermo has a full-width end washroom. It’s roomy enough for family use, with a large shower and a good-sized sink, but not the most spacious in the range, thanks to the decision to place the wardrobe on the offside in here, with a built-in laundry basket. We’d also rather see an obscured rather than clear window in here to add privacy. You could be forgiven for wondering quite how you make a double bed out of those long, curving sofa backrests – and the answer is, you don’t! This is where the Pegasus gets clever, with a new make-up system that Bailey is calling ‘Dream Sleep’. The sofas are long enough to be used as single beds by six-footers, but to make a double you simply pull out the slats beneath the recessed front chest, turn over the sofa bases and then flip out the top of each one. The result is a huge, flat bed with a new breathable, antibacterial cover. It works really well, reducing the number of joins and feeling more supportive with the new ‘honeycore’ foam construction; as for those backrests, they can be tucked out of the way underneath. Move back past the kitchen and you’re into the kids’ realm. One of the neat changes in the new Pegasus is the redesign of the fixed-bunk layout to bring those beds right into the room, rather than tucked away beside the washroom as in the old Ancona. Each bunk gets a reading light and the lower one has a much larger window to avoid it feeling like a cave in there. If you have an additional guest, the dinette can be made up into a berth, and if that’s not enough you can specify an optional sixth bed in a fold-out bunk above it. And when you’ve had enough of the kids or want to give them some privacy to get to sleep, a two-part screen closes the rear off from the rest of the van. The wardrobe (in the washroom) is pretty big, although sadly it’s where the freestanding table lives, right at the back of the van. There’s masses of other storage options in here, however, with plenty of overhead lockers, a front chest and one of the largest sideboards we’ve seen, with big drawers and a cupboard beneath, plus aerial and plug sockets for your telly on top. The Bailey Pegasus Palermo and its siblings mark a true return to form for the Pegasus range. Look hard and you’ll spot the savings over the Unicorn – such as the mixture of roller and pleated blinds, or the lack of Alde heating – but overall this feels like a very special caravan, and one that looks notably more modern inside and out than its predecessors. And, unlike the Unicorn, with the five- (or even, optionally, six-) berth Palermo, it offers those qualities to the large family audience, at a more affordable price.